Since it was my big 2-5, I thought about doing something I always wanted to do which was to stay in a haunted hotel and what better place to be then the one of the most haunted towns in America. Historical Gettysburg. We stayed at the Farnsworth House Inn, which was named and honored after Brigadier General Elon John Farnsworth. "...who led an ill-fated charge after the failure of Pickett's charge, claiming the lives of Farnsworth and 65 of his men. The original part of the house was built in 1810, followed by the brick structure in 1833. The house sheltered Confederate sharpshooters during the three-day conflict, one of whom it is believed to have accidentally shot 20 year-old Mary Virginia "Jennie" Wade, the only civilian who died during the battle. More than 100 bullet holes pock the walls. Following the battle, the house served as a hospital. The Lincoln procession passed the Farnsworth House on November 19, 1863, on the way to the National Cemetery where he delivered the famous Gettysburg Address..."
We were greeted by the friendliest staff who showed us to our room where we researched was a pretty active room paranormal wise. My cousin and I wanted to experience some activity. When you first get into the room, they are beautiful rooms but they definitely have a creepy vibe to them. Next the the bed is a journal of everyone who stayed in that room who wrote down their experiences. Some of the stories were so creepy which only added to the creepiness vibe. 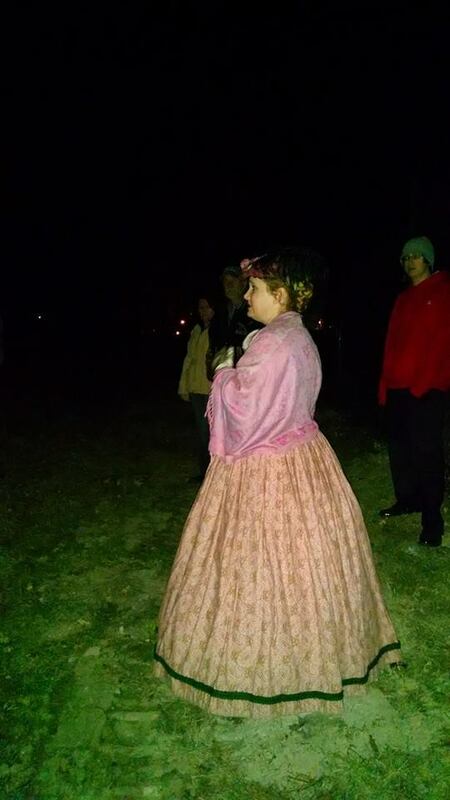 We immediately wanted to go on a ghost tour which Farnsworth Inn offers. They are so worth it. The tour guides and the people who worked at the Farnsworth Inn were very knowledgeable about the history of Gettysburg along with many war stories including haunted history. My cousin and I were so excited to do the walk through of the Farnsworth Inn and parts of the battlefields outside. We met in a basement where dead wounded soldiers were held. My cousin didn't feel or see anything but I heard a whisper in my ear which startled me during the tour. I told my cousin, this should be interesting. Later we walked outside and stood on the fields where thousands of Confederate and Union soldiers perished. Old toys that can make lots of noise where all around the room. Children ghosts freak me out more than anything and plus we heard a scary story of a soldier who died from being shot in the neck in what was now our bathroom and there was blood everywhere. I had that image in my mind the whole time I stayed in that room. The journal in this room was definitely creepier than the last room we were in. Staff told us that Jeremy likes to play with his toys and if we left anything out he may play with it. So I left a ball in the bathroom and other toys around the room for him to play with. The first night we barely slept but this night, I knew I wasn't going to sleep especially with the creepy porcelain doll next to my bedside table. The next morning after having maybe an hour of sleep. We still didn't experience too much but there was a lot of banging in our room which was unsettling. We decided to go Jenny Wade House tour, the only civilian to be killed during the battle. "...It has long been said that when a woman places her ring finger in the bullet hole, she will soon be proposed to, and a ring will be placed on that finger. We regularly receive letters and emails confirming that the Legend came true. It is our belief that Jennie, her marriage thwarted and her betrothal cut short by death, would want to bring to others the marital bliss that she was denied..."
My cousin and I did it of course. The tour guide said the legend says it happens from 6 months to a year from the time you put your finger in the bullet hole. *Fast forward, my cousin and I met our significant others around the same time and a year is coming up soon. So we'll see if the legend is true! We told the staff we would have joint engagement parties. Next we wanted did the battlefield tour which we thought was a bit expensive. There is an option to drive yourself around town and follow the map and signs on the road. Each stop had a description of each event or significant part of the battle. We also walked through The National Cemetery and in November it was the perfect time of the year. Autumn in Gettysburg is beautiful and eerie. Also, it's low season for Gettysburg which makes going on the tours easier and sometimes you pay for a group tour but you may be the only ones on it, so you can get "private" tours. There is so many things to do in Gettysburg, I was only there for two days and I didn't want to leave. You can be there for 2 weeks and have enough things to do. There is a lot of history along with haunted history to keep you busy. Learning about the civil war in school is nothing compared to standing on the actual fields where thousands died. It's a surreal feeling and almost hard to comprehend how many people were fighting those 3 days in Gettysburg. If you ever have the opportunity to go, I highly recommend everything I did especially the hotel and tours I did.